I’m doing Pajiba’s Cannonball Read again this year, and I just posted a review of Pictures at a Revolution: Five Movies and the Birth of the New Hollywood by Mark Harris. Stop by and check it out! Here’s a list of things I don’t generally think are funny. 2. People sick or in pain. 4. Stupid situations met with even stupider situations which snowball into one gigantic, stupid mess. Yep. I just described pretty much every big-name comedy to come out since 1998’s There’s Something About Mary (which I hated, by the way). This is all to explain why I just rolled my eyes a lot when everyone started talking about Bridesmaids. I like that it was a female-driven comedy making big bucks, of course, but I got the impression that it was mostly more of the same, and I was really wasn’t very interested. I think I finally decided to give it a shot when it actually got some award-season love; I do enjoy Melissa McCarthy and Maya Rudolph, and I don’t have anything particular against Kristen Wiig. 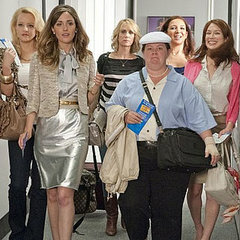 So, I watched Bridesmaids. I didn’t think it was the most hilarious thing ever, but I did like it. So maybe I do have some kind of sense of humor left? Annie (Wiig) has been hit hard by the recession. Her bakery went under, her boyfriend left her, she’s in a really crappy roommate situation, and she’s working at a lousy job. So, when her best friend Lillian (Rudolph) gets engaged and asks her to be the maid-of-honor at her wedding, she has to work pretty hard to feel any real enthusiasm. Her troubles really begin when she gets into a game of one-upswomanship with Helen (Rose Byrne), another bridesmaid who clearly thinks she should be running the show. What follows is a series of unfortunate events as Annie tries to plan all of the various occasions that take place in the lead-up to a wedding. A lunch and dress-shopping expedition ends in food poisoning for most of the bridal party, which includes Ellie Kemper as a wide-eyed newlywed, Wendi McClendon-Covey as her polar opposite, and Melissa McCarthy as Lillian’s masculine sister-in-law-to-be. A trip to Vegas for a bachelorette party winds up with the party being removed from the plane, and when Helen appropriates Annie’s idea for the bridal shower, all hell breaks loose and Annie hits a new low. Naturally, you can expect a sincere pep talk (courtesy of McCarthy’s Megan) and a shiny, happy ending, complete with love interest, in this case an adorable cop played by Chris O’Dowd. It’s a cute movie. Kristen Wiig is likable and believable as Annie, and she and Rudolph have a solid chemistry. McCarthy does indeed steal the show, and I enjoyed Rose Byrne’s character as well. I think that the performances and the story were the movie’s main strengths. The broad outline is not particularly original, but comedies don’t need originality of plot as much as a new or different perspective, and in that sense, Bridesmaids is successful. It was very fresh and current and definitely hit the nail on the head with regard to the ridiculousness that is the wedding industry. It was clearly written from a woman’s point of view, and I appreciated that. It suffered a bit (for me) from the utilization of those items on my list of not-funny things and from what I call “SNL Syndrome”: the tendency to keep a gag running about two minutes past the point where it stops being amusing. All in all, I really enjoyed the movie, but I sort of think that it actually could have been just as successful were it not set up as a “blockbuster comedy”. Does that make me a stick-in-the-mud? I liked the characters and would have welcomed a bit more development and insight into them instead of a big scene involving poop and fancy gowns. The film’s message, too, was relevant, indentifiable, and well-presented. I guess that’s really my one complaint: I thought it was a fun, cute movie that involved some parts I didn’t think were funny, and therefore could have lived without. I have to wonder, a bit, if those scenes are really what made the movie a huge success, or if maybe people were actually sympathizing with the realistic characters and relate-able story instead. Did you see Bridesmaids? What did you think? Oh, a final, girly note: I mostly spent the whole movie exclaiming over Kristen Wiig’s wardrobe and hair. I need both. Seriously. Seems like I’m on a musical kick these days, doesn’t it? I promise it’s no more than usual; we’re just trying to make more of a push with our AFI viewing, and West Side Story is #41 on the list. I would also add that it’s #2 on their “Greatest Movie Musicals” list, which we’re going to work our way through as well. We’ve both seen West Side Story a few times before, but as with all of the AFI films that I’m re-watching, I try to pull together my thoughts and understand the movie’s importance and influence. West Side Story is not a favorite of mine. I first saw it when I was probably fairly young and my understanding of musicals was informed by things like Mary Poppins and Chitty Chitty Bang Bang. Compared to those, Jerome Robbins’ and Robert Wise’s adaptation of Shakespeare’s Romeo & Juliet is quite a different animal. I was interested to see it again as an adult; I felt I could be more open-minded and see it with fresh eyes. But you know what? I still didn’t like it. I could see a lot of really important and good things happening, but as a whole, there are (in my opinion) some really big problems with this classic. I hope I won’t be spoiling anything for anyone here; if you don’t know the plot of Romeo & Juliet by now, I’m not sure there’s any help for you. West Side Story moves the action to Manhattan in 1957. Instead of the Montagues and the Capulets, we have two street gangs, the white Jets, led by Riff (Russ Tamblyn), and the Puerto Rican Sharks, led by Bernardo (George Chakiris). Our star-crossed lovers are Tony (Richard Beymer), Riff’s best friend who’s outgrown the whole gang thing, and Maria (Natalie Wood), Bernardo’s baby sister. Anita (Rita Moreno), Bernardo’s girlfriend and friend to Maria, takes the place of most of the secondary female characters in Shakespeare’s play, while Tony’s employer Doc (Ned Glass) stands in mostly for Friar Lawrence. The biggest departure from the source material is that Maria, unlike Juliet, is left alive at the end of the play, as is Chino (Jose de Vega), who is West Side Story’s Paris. 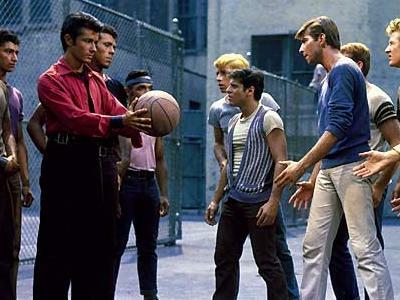 In the world of film musicals, West Side Story is obviously ground-breaking. With music by Leonard Bernstein and choreography by Jerome Robbins, it is a true departure from the bright and shiny MGM musicals, and was surely meant to be. Both the score and the dance sequences are iconic at this point. In a way, though, it is the very contribution of these great artists that flaws the movie, which to me seems fragmented into three pieces that mesh together at points, but are more often disconnected from each other. Robbins, who conceived the Broadway play from which the movie is derived, was creating a contemporary ballet of R&J. Bernstein’s score is itself fragmented between his usual style, exemplified in songs like “Cool” and the more saccharine songs of the love story like “Maria” and “Somewhere.” And finally, there’s the meat of the piece, the dramatic story. The acting is all quite good, particularly the two leads. The problem arises (for me, at least) when you realize that neither Beymer nor Wood did their own singing. They were clearly chosen to star in a musical for reasons other than musical ability, and even though their performances are good, that fact remains and mars the overall effect. To me, it adds to the question of whether or not there were clear priorities for the film as whole. Essentially, in watching the film, there were many times when I felt I was watching three different things: a ballet, a musical, and a play. All three of those things were well-executed, but they just didn’t seem to go together more often than not. It can certainly be argued that Romeo & Juliet is, itself, two disparate stories, one of love and one of hate, but Shakespeare’s play seems to weave those two themes together more successfully than here. Obviously, West Side Story was a huge critical and popular success, and it won countless awards, including Best Picture at the Academy Awards. I do think that, for its time, it was doing something truly different and outstanding; it was bringing the movie musical out of the last few centuries and into the present day, and for that it is certainly an important piece of work. But judged solely on its merits as a film, I don’t think it stands up to the values of the great musicals that preceded it. So, I’m not really sure that I have conveyed my serious excitement about the upcoming blockbuster awesomeness that will be The Avengers enough here, but please understand: I am super (ha ha, get it?) excited about The Avengers. And do you really need to ask why? Well, just check out this new clip for the answer. Rather, answers. There are two of them. In other exciting news, I am loving the pictures coming out from the Les Miserables shooting as well. I mean, seriously. Look at this one! 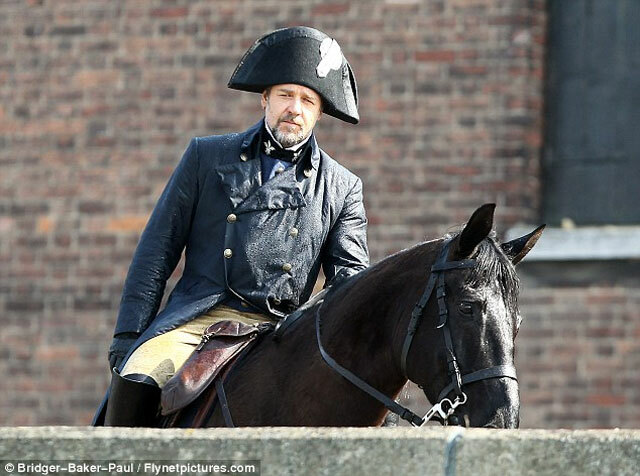 That, my friends, is Javert. So. Awesome. 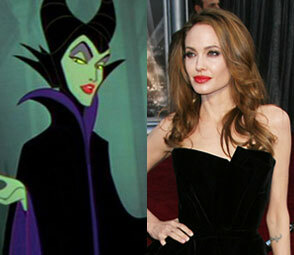 And finally, if you haven’t heard, there’s going to be a live-action film about Maleficent. As in, the fabulous dragon-lady villain from Disney’s Sleeping Beauty. And starring as herself? Angelina Jolie. Doooood. In early discussion, it was going to be directed by Tim Burton, but he’s no longer attached. That’s no great loss if you ask me. They haven’t started filming yet, but Jolie’s already gone on record talking about it and says she’s very excited. Elle Fanning is also attached to play Princess Aurora. I think it’s a really cool idea with excellent casting … a lot of people like to paint Angelina Jolie as a bit of a villainess anyway so I think it’s great that she’s going to play such an iconic baddie, and as the main character in her own story, too! Just a few of the movies I’m pumped about these days … How about you? What’s got you jumping to head to the theater? If you have spent any time here at all, you probably know that I am an avid fan of Gene Kelly. He’s my go-to guy for singin’ and dancin’ (whether in the rain or not). As such, I have to admit that I am so far woefully ignorant of that other movie musical great, Fred Astaire. While I don’t think he will ever replace Mr. Kelly in my affections, I am more than happy to educate myself in terms of Astaire’s movies as well. Of the films I’ve seen so far, none have co-starred the fabulous Ginger Rogers. So, last weekend we watched Top Hat, which is the fourth of ten movies featuring the Astaire/Rogers pairing. It was definitely a treat. Top Hat is the story of song-and-dance man Jerry Travers (Astaire) who is footloose and fancy-free, in London to do a show for producer Horace Hardwick (Edward Everett Horton). He’s dancing late at night in Horace’s hotel room when he disturbs Dale Tremont (Rogers) in the room below. She comes up to complain, and the two are immediately enamored of each other. What follows is some flirtation and some dancing, until Dale comes to the false realization that she has been flirting with Horace, who she has never met but who just happens to be married to her friend Madge (Helen Broderick). To make matters even more entertaining, Dale is on her way to meet Madge and Horace in Italy, where Madge hopes to set her up with … Jerry. This comedy of errors proceeds to its predictable conclusion with plenty of laughs and plenty of dancing. This is a funny, quirky little movie. I thought the plot was a little bit of a mess, but I was impressed with how long they managed to keep the case of mistaken identities going, even when more than just two of the characters are on screen together. The miscommunication between Dale and Madge regarding the identity of Dale’s would-be suitor was especially hilarious, and surprisingly scandalous, particularly (I would assume) for 1935. Horton and Broderick are consistently entertaining, and supporting turns by Erik Rhodes and Eric Blore as a hot-headed Italian designer and Horace’s Jeevesian valet, Bates, add to the hilarity. As for the leads, I don’t want to ruffle any feathers, but I think in terms of acting, Rogers might be superior to Astaire. In everything I’ve seen of him he stays genial and unflappable throughout, whereas Rogers gets a little bit more range in terms of her perspective. 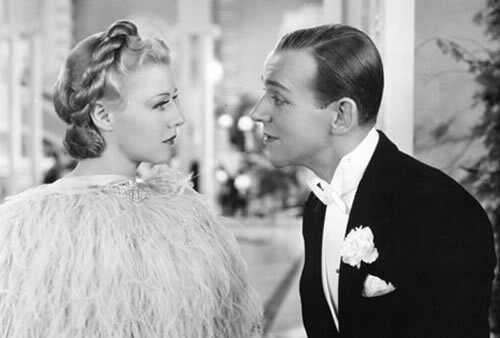 That said, the reason we watch Ginger Rogers and Fred Astaire movies is to see them dancing, and Top Hat definitely does not disappoint; they actually dance together a record five times. Their “Cheek to Cheek” routine is the standout, although the company finale is also one to watch. Featuring gorgeous costumes, fabulous choreography (of course), and songs by Irving Berlin, I think Top Hat is definitely a movie to watch if you’re interested in seeing some classic Astaire/Rogers.